FC Augvstus had a terrible week, a culmination of Monreal getting 0 mins for not playing, Maicon receiving a 0 points rating due to conceding 2 goals and getting a yellow card, and an averagly poor Toure as captain. With Celtic having almost gotten a draw out of Barcelona at the Nou Camp, eyes are on the Scottish Champions to see if they can pull off an upset in the reverse fixture. The last game between the two left Manchester City on the brink of going out of the Champions League. With Mancini even going as far to say that they needed a miracle. Can Ajax put down the Manchester outfit this season? 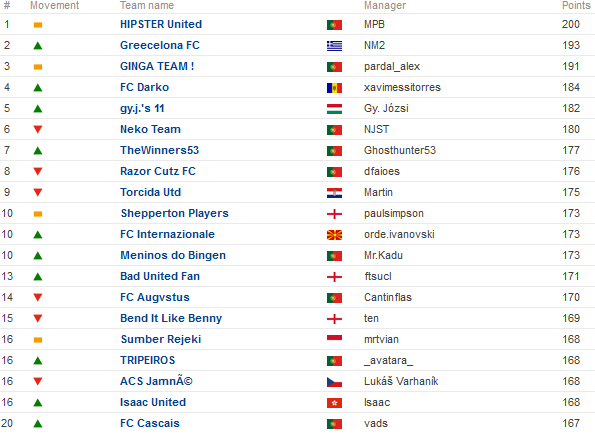 You are reading "Fantasy Champions League 2012-2013".